These data show use of LISST-SL and -SL2 from bridges. For use from boats, click here. The LISST-SL2 instrument delivers the most powerful suite of sediment data. It is an isokinetic instrument (isokinetic means intake velocity matches river velocity). The parameters it measures are: depth, optical transmission across 3mm path, river velocity, water temperature, sediment concentration, and sediment size distribution. We show data from Cowlitz river in the city of Castle Rock, Washington (see location of bridge below [arrow]; and LISST-SL suspended from bridge, ‘swimming’). Fig. 1 above shows all the data after processing on standard software. The panels, left to right show vertical profiles of: optical transmission ( a turbidity-like measure of sediments), river velocity, sediment total concentration, and sediment size distribution. The concentration estimates are verified by physical samples taken by USGS personnel (red circles). This figure clearly shows that turbidity (first panel) misses the structure in concentration (third panel). The fourth panel shows size distribution profile. A washload at a φ value of 6 is well mixed; a coarse mode grows with increasing depth. This was the first such data in a river column. 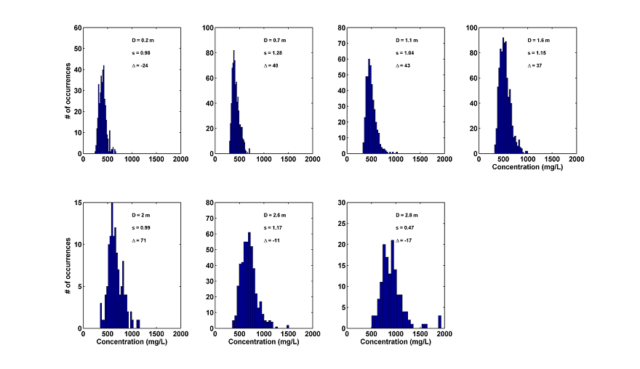 The size distributions profile shown in the fourth panel above is easier to visualize in a more familiar view below. It clearly show the absence of large grains near the surface, and the steady increase in coarse grain concentration as depth increases. 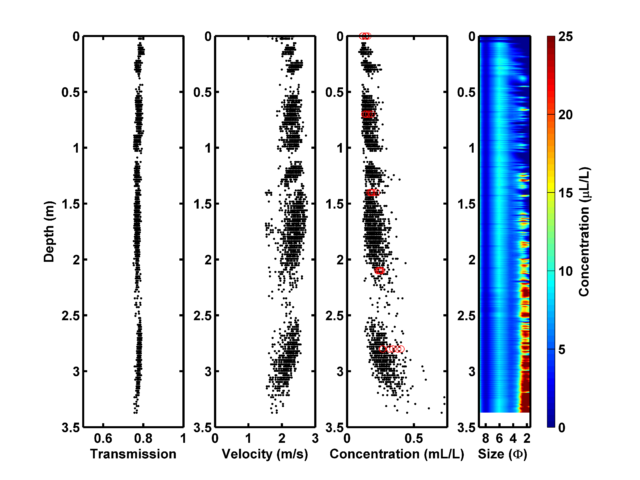 This is the power of laser diffraction over single parameter sensors such as turbidity or acoustic backscatter. Simple averaging by depth yields the equivalent of Point-Integrated-Sample values, commonly used by US government agencies. A full-depth integration yields the Depth-Integrated-Concentration value. These were obtained by old sampling devices, such as a P-61. Figure 2 above shows the histograms for concentration at different depths, first being at surface, and subsequent ones being at depths increasing by 0.5m. Note the increasing spread with depth, implying intermittency for resuspension. 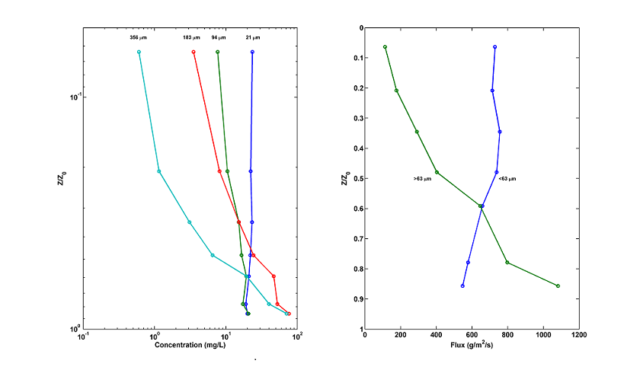 Figure 3 above left shows the concentration profiles, or equivalently, Point-Integrated-Concentrations for 4 different sizes. The gradient of profiles increases with increasing size, which is expected by theory. The vertical gradients can be used to compute the friction velocity (u*). 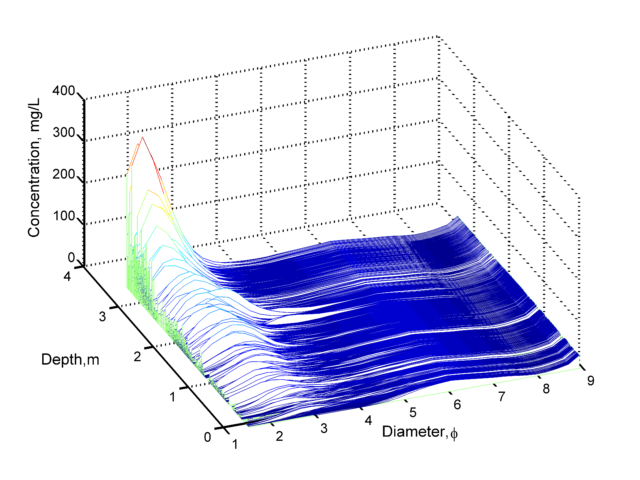 Figure on right shows the flux, or rate of sediment transport per unit width per unit time as a function of depth. In this case, the well-mixed wash load (blue) is distinguished from suspended load of sand (green). These are details that were not previously available. see variance of concentrations, (in addition to mean values); useful in determining averaging (integration) time. examine time-series and from that, the integral time-scales and spectra of fluctuations of different size particles. Such scaling is of interest to science and for modeling. examine the acoustic backscatter cross-section at any frequency, see e.g. Agrawal and Hanes, Water Resources Res. (2015). Not only is such detail valuable in research, information such as this can improve management of reservoir siltation, hydropower intakes, sediment diversion etc. For a list of papers published with LISST-SL, please click here. [You can obtain an updated list of such publications by going to www.scholar.google.com and searching for LISST-SL]. These measurements and derived quantities are only available uniquely from Sequoia’s LISST-SL instrument (our more advanced LISST-SL2 is now available; it does this all, only better!). ACKNOWLEDGMENT: The LISST-SL was originally developed with the encouragement of scientist John R. Gray, from the US Federal Interagency Sedimentation Project, and USGS.